There was I HOPING that we'd be imprisoned together for 6 weeks with nothing but an old box of Lego pieces and some broken Ben 10 figures to entertain us but no: it appears we are to be forced out doors to enjoy such nourishments as the local paddling pool, bike rides round the park, picnics in the woods and Olympic Torch Relays. I'm not sure what will happen to my blogging whilst I'm on Full Time Active Mother Tour of Service but I suspect it will get less regular and less bookish. However I'll try to give you a snapshot of our day's activity with a book recommendation to accompany it where possible. Theme of the day today is Hair. It's important to start the holiday with the removal of shag so it has time to grow back and look as disreputable as possible before the new term begins again. Bill is looking particularly impressed at being asked to demonstrate his wonky mother-cut fringe isn't he? No matter- he is about to be Transformed by the scissors of an expert. Both my children used to holler and flinch on the hairdresser's chair. There was no particular secret to this phase passing beyond taking them to a rather chichi specialist children's hairdressers where in exchange for a substantial fee they are bribed with a table of action figures, sweets and books. If the same problem besets you however you could do worse than trying to get hold of a copy of 'Need a Trim Jim' by Kaye Umansky, illustrated by Margaret Chamberlain (out of print- curses-but still easily tracked in libraries and second hand). I love all their 'Jim' books; 'Pass the Jam Jim' most of all but this would run a close second. Jim doesn't want to get his blonde thatch cropped despite crashing into walls and finding it hard to get his spaghetti in his mouth. He's worried it's going to hurt. Will the benefits of being able to see again outweigh the trauma of facing the scissors? I think we know the answer. Great rhymes and exuberant illustrations make a trip to the hairdressers FUN. Bill looking completely different now obviously. hmmm. I can see I'm going to be attacking him with the paper scissors again soon. at least his fringe is a bit straighter. so that was worth £15 then. Right that's the scintillating haircut post done to be only out-scintillated by the inevitable shoe shopping post to come... But I think I can promise More Exciting Excitements tomorrow. 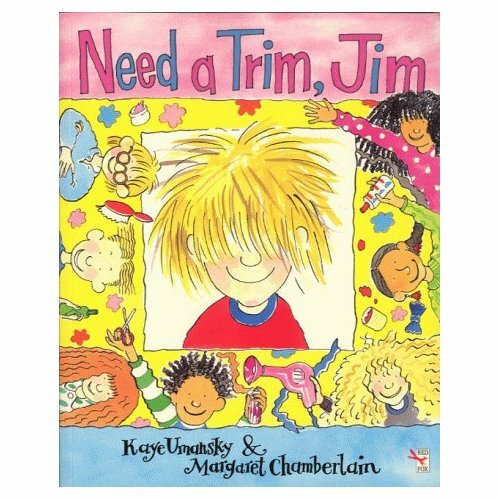 'Need a Trim Jim' written by Kaye Umansky, illustrated by Margaret Chamberlain, pub. Red Fox if you can find it. and I see your bathtub comes with a supply of comics for free! much more sensible. If it can possibly be the case that you have never read Pass the Jam Jim then all I can say is You Must.